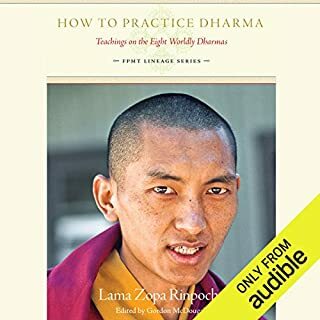 Buddhism is a house full of treasures – practices for gaining the happiness of future lives, the bliss of liberation and the supreme happiness of enlightenment – but knowing the difference between Dharma and non-Dharma practices is the key that opens the door to all those treasures. 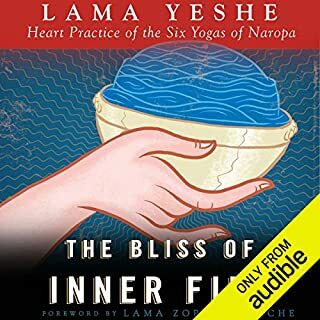 No matter how much we know about emptiness, the chakras or controlling our vital energy through kundalini yoga, it's all pointless without this crucial understanding of how to practice Dharma, how to correct our actions. So very practical and concise. A new edition of this perennial classic. 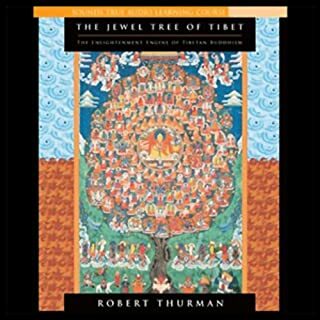 "The best introductory work on Tibetan Buddhist tantra available today." - Janet Gyatso, Harvard University. 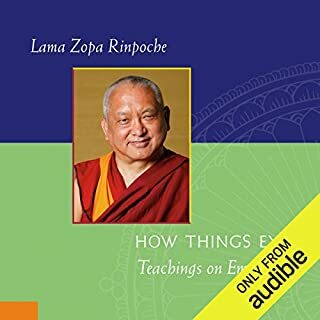 ©2014 Lama Zopa Rinpoche (P)2016 Audible, Inc. I absolutely loved this book, however I feel they could have used a different Narrator. Still very enjoyable though.. I wish i had discovered this understanding of buddhism a long time ago. 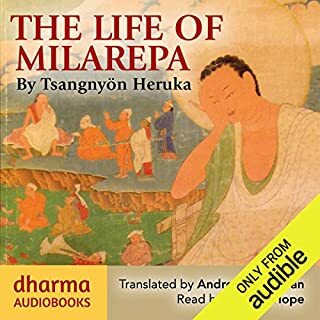 I made the mistake early on of thinking that earlier buddhism (hinayana) was more authoritative and superior. 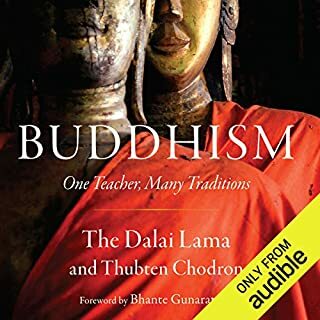 I have since learned that i have almost no interest in early buddhism, and greatly prefer mahayana and tantric conceptions. this book will also be useful for people studying hindu tantra. Fajer Al-Kasai gives a dry and imperious reading of this millenial-old knowledge and practice; sounds downright unfriendly. 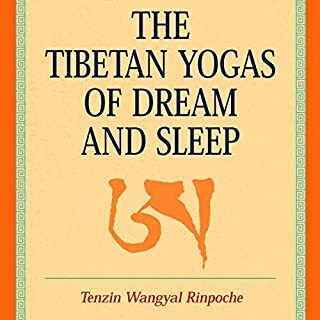 Lots of practical advice; kind of avoids zeroing into anything smacking of spiritual bliss, which I thought is what Tantra is about. I will reread, perhaps I am being too harsh just because I didn't glean from it what I expected. 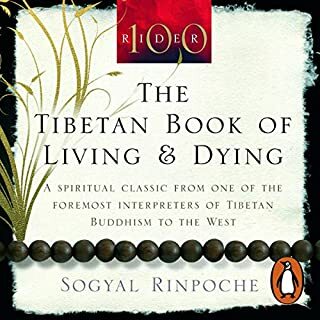 The narration was fine until Tibetan terms came up. I don't speak the language, but either this guy is right and everyone else I've heard is wrong, or it's the other way. Also, it's a very high level summary so there is nothing in the way of a concrete practice to really take from this text. I learned a fair bit, but got nothing I can take to my regular sitting practice. 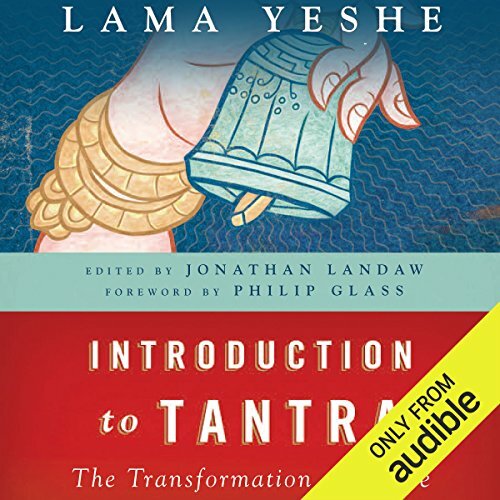 Wonderfully enlightening introduction to the practice of Tantra. 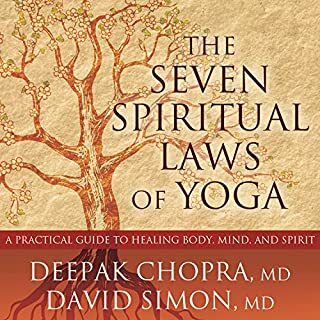 Straightforward and easy to understand without being abstract, while maintaining Tantra's divine qualities of mysticism. I really wish this book had more content. It seemed to have a heavy tone of repetitive reinforcement. 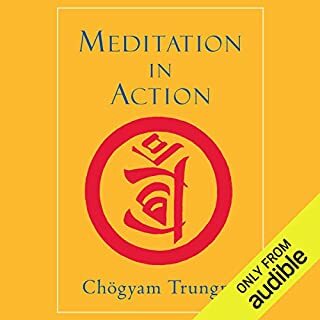 If Tantra is the Way, and we are supposed to find our own way by being a natural person, then this book has some hypocrisy to it . Everywhere in the narrative, the idea that you need a guru for your evolution and self realization is reinforced over and over. Like other religions it supports the idea that you must have a mediator to find your way. The other thing is that the author assumes all readers have low self esteem and are negative to begin with. It supposed that the reader suffers from low self esteem and doesn't have any spiritual experience or self evolution. It further supposed that the listener needs a guru to give all this attention to in trade for enlightened experiences. If Tantra is supposed to be a "short cut" and our direct route to the God-consciousness within, then there should not be the necessary inclusion of a guru. Further, the meditation tells the listener to focus on the guru and the family of gurus/God's to invoke some kind of connection to them. All of our devotion is supposed to go to them. This instruction seems to further the distance between ourselves and the inner God-realization within each of us. Like many religious indoctrinations, this book is no different. There are no short cuts in life. All that we are and ever shall be can be found within us. But society has created systems that seem to loop and fall back onto itself. If you are a Buddhist, you believe that by praying and meditating on Buddha, you will find the Way. If you are Indian, you believe that by focusing on your Deity of choice, you will find the Way. Hopefully you get it right and do not have to reincarnate over and over again. If you are a Christian, you believe that if you focus on Jesus, you will find the Way and not go to Hell. Every religious approach supposes you cannot find your way. This book's philosphy uses the same belief only offers short cuts. But it doesn't have any "short cuts" to self realization because it still uses a mediator, the guru, as a means towards the Way to enlightenment. 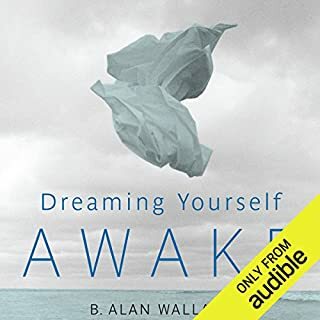 Because the wording in the book has a very "must do" approach, the Narrator does a good job of sounding quite paternal and proud in every sense and does a good job of carrying the tone across in this audio book. Personally, it had some snooty undertones that did not help, although I belief the Narrator did carry the energy of the message exactly as intended. 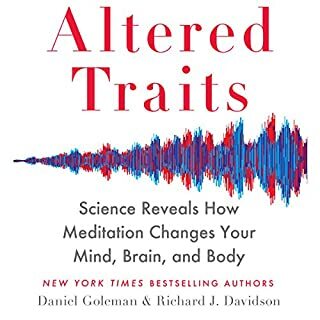 The main technique and practically the only technique offered is to meditate. In this respect, it doesn't offer anything that hasn't already been done or discovered. 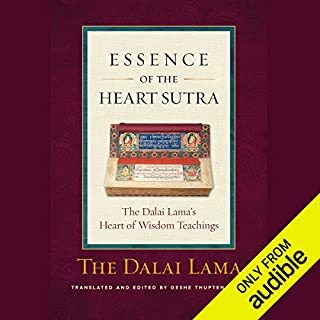 The book advises the listener to find a master guru to learn more. So unfortunately, it did not offer anything that the listener could have the confidence to find within. I got through half the book and realized the rhetoric was the same. I could barely finish it. If evolving spiritually is an inner journey, and we are to find the Way, then nothing external (not even a guru) can walk that Path for us. At most, the events in our lives trigger something deep already within us that we bring to the surface of our awareness. We discover what is within and keep or discard our beliefs that help or impede us by our life experiences. Through these experience, we observe ourselves and learn about our nature and beliefs. We separate and make discerning choices of what we want to keep or let go of. This is the Path of the Self realized being. And you don't need a guru, a doctor, a psychiatrist, a medium to do this. 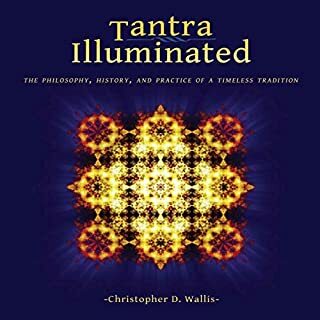 Would you consider the audio edition of Introduction to Tantra to be better than the print version? 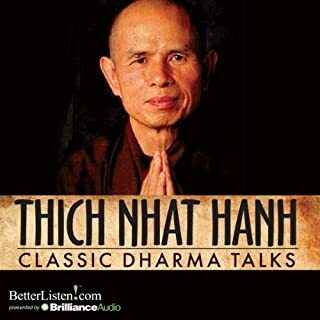 For this type of material, the audiobook was so so great for me. I have a very hard time reading & comprehending this in print version. With audio, I can listen to it over & over again which works for me. What about Fajer Al-Kaisi’s performance did you like? The voice was easy to listen. Sometimes I fell asleep. 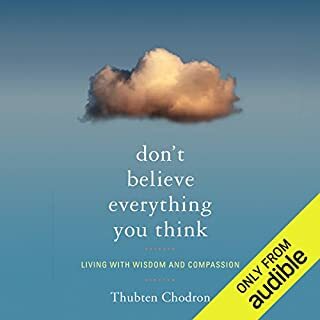 Great audiobook during any commute. The fact that this was read by an American opens it up to the world. Not over cluttered with jargon and technical words. I really liked this book. It gets straught to the point, metaphors used to describe difficult ideas are well chosen and easy to grasp. 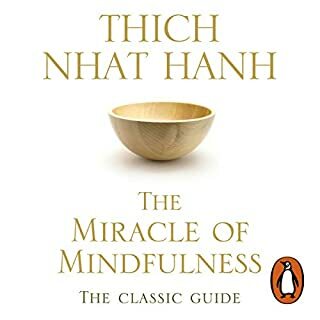 This is yet another book that it so meditative and worth every minute of it. A complicated subject with a lot of folklore yet explained clearly and beautifully. Thoroughly enjoyed the book and the reader.